COMMENTARY — The Sun Devils were doused in the Salt Lake City rain this past Saturday as the Utes pulled off another win to improve their record to 6-0 and 3-0 in conference play. The win makes Utah bowl eligible and affords them a comfortable 2-game lead in the Pac-12 South Division. The Utes’ defense played spectacular as technically they were responsible for giving up only 6 of the 18 points that Arizona State scored. The offense took a while to get going, but surged in the fourth quarter to give Utah its first win over the Sun Devils since 1976. For you NFL fans, a week ago the then-undefeated Atlanta Falcons played against the Washington Redskins in a game that I can’t help but find some similarities to Saturday night’s game against Arizona State. The Falcons offense was not itself and struggled most of the game, while the defense played well overall. In the end, Atlanta was victorious in overtime when the defense intercepted the ball and ran it back for a touchdown. That isn’t exactly the way the Utes won against the Sun Devils, but the biggest similarity that I can see is that despite struggling at times, especially on the offensive side of the ball, Utah still found a way to win. As I watched the Utes orchestrate a comeback in the fourth quarter to win the game, I couldn’t help but think of that Atlanta game. Great teams find a way to win and Utah found a way to win when the going got tough. The Utes have a great team this year — perhaps the best since the 2008 undefeated team. That gives Utah fans something to get excited about in light of the poor seasons and resulting frustration during the Utes first few years in the Pac-12, although they really turned the corner last year. The No. 3-ranked Utes are arguably the best team in the nation. And I am not just saying that because I am a huge Ute fanatic! Sixteen voters in the AP Poll agree with me, as Utah once again received more first-place votes than any team except top-ranked Ohio State. I also have numbers on my side in support of the proposition that the Utes should be ranked first in the nation, especially in comparison to the remaining undefeated teams in the Top 25. Now I am the first to admit that numbers are not my thing, but the numbers are simply too remarkable to ignore. Utah is currently No. 3 in the AP Poll, seventh in the Coaches Poll and third in ESPN’s Power Rankings. Why in the world are teams like Michigan State still ranked ahead of the Utes in any poll? While people can always rationalize their own subjective rankings, especially fans, and even media catering to a particular fan base, the cold hard facts are indisputable and the numbers don’t lie. The evidence supports a claim that Utah is currently the best team in the nation. When looking at the remaining undefeated teams in the Top 25, there are five factors that provide considerable insight into how each team has performed thus far against their opponents. Number of wins against teams currently in the Top 25 (early season rankings are essentially worthless, and many teams ranked early on simply did not deserve their rankings, but by this point in the season, ranked teams have actually proven something). Combined records to date of all opponents (is everyone else beating them, too, or are the undefeated teams really accomplishing something by beating them). Number of opponents to date who currently have a winning record. Average points that the team has allowed to be scored on them and the high points allowed. Average points that the team has scored on its opponents and the high points scored. The Utes are the only undefeated team with two wins against current Top 25 teams. 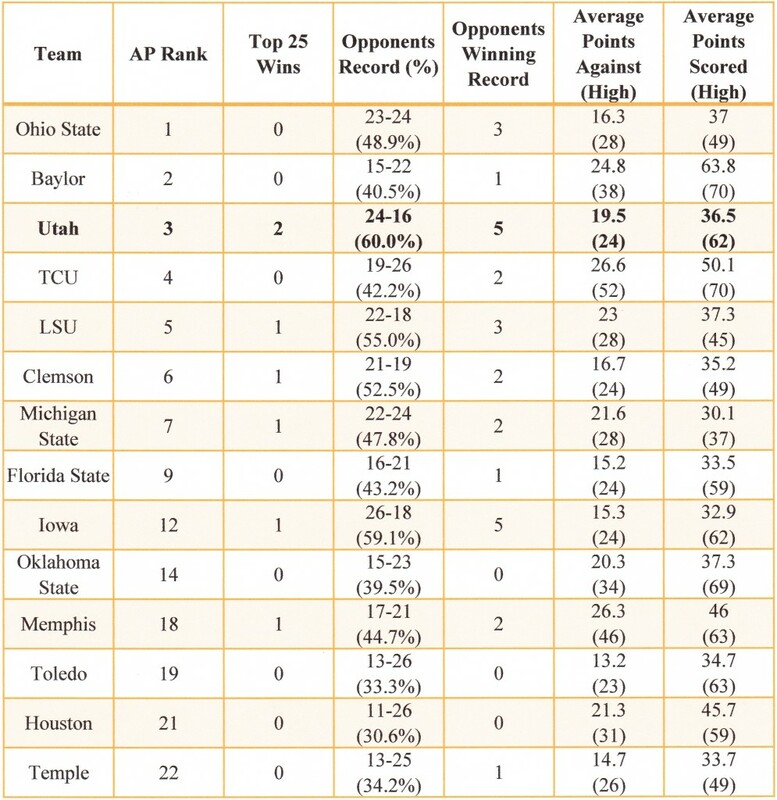 Utah’s opponents have a higher combined winning percentage than any other undefeated team (and notably, significantly higher than Ohio State, Baylor and TCU). Five of Utah’s six opponents to date have a winning record, while the overwhelming majority of the other undefeated teams have only played a few opponents with winning records. It is time for the nation to face the facts and recognize that the Utes have proven more than any other team thus far this seasonthat they deserve to be No. 1. I wish more of the voters would actually look at the facts and numbers, and hopefully the playoff selection committee will do just that regardless of the inherently subjective nature of both the AP and Coaches Polls. There is still a lot of football to play and there are no gimme games in the Pac-12. The Utes will face another challenge this week against the Trojans at The Coliseum. Even though USC is a bit down after losing their head coach and tough losses to Stanford and Notre Dame (currently ranked 10th & 11th respectively), I would not count them out and they certainly pose a worthy challenge for Utah. However, if the Utes can continue to shine on defense and play up to their true potential on offense, I sincerely believe Utah can “go the distance” and show the Trojans that the Utes are the true heroes of The Coliseum. Today’s Bleeding Red sports column was guest-written by Joshua Vance. The opinions expressed are not necessarily those of St. George News.